By kimblanchard, September 16, 2004 in INTRODUCE YOURSELF! Hi, just wanted to introduce myself and say hi to all the courageous folks here. I am a medical oncologist, actually the director of a thoracic oncology program in a community medical center. I sometimes like to peruse these boards just to keep in touch with things from my patients' perspective and would like to learn from all of your experiences. Would it be awkward for me to post here? It looks like everyone I have seen is either a survivor or loved one and I wouldn't want to make anyone uncomfortable by invading as an "outsider". Welcome. We have often hoped Drs would join! You might get a lot of questions, so be prepared! I think it is wonderful that you have joined. You seem to care about how patients feel. Thank-you for that. Oh my gosh no, please post away. We had a regular member Sam that was a physician. It was so nice to have his input and help with medical questions. Sam lost his battle with lung cancer and we can use all the medical knowledge we can get. Welcome! 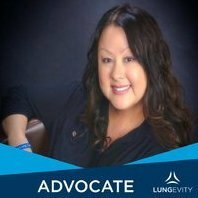 I'm the sister of a lung cancer patient, and when my brother first told me about this group I hesitated to participate because I thought maybe patients and caregivers should have this place to themselves, private. My brother set me straight on that one - ha! I think you will feel very welcome, if not overwhelmed. People need information AND support, and all are welcome! Thanks for posting, I hope we hear from you again. Thanks so much for the warm welcome! This seems like a very active and friendly site, I look forward to "meeting" everyone. Yes, you are very, very welcome here! We have another oncologist (rwoodburn) that posts occasionally. He gave us all a great education on the different types of stereotactic radiosurgery. I'm sure you have already scrolled through some of the site and see that we have a lot of questions and post a lot of symptoms, but we also post a lot of emotion. Anything you have to say is greatly appreciated! Thanks for joining. I just saw this after sending you a PM. Welcome. Look forward to getting to know you too. You are more than welcome here. I am sure you will learn something and I am sure you can teach us all a few things when we go astray. As you will see we let it all hang out on this board. From emotions, to treatments, to anger and most of all support. Please stay with us. We would love to have your perspective. And I hope that we can help your understanding as well. Becky and I were fortunate to have a set of doctors that all shared our goals, with one exception. One oncologist upon meeting us told me that three years would be a good result. And so we never met with him again. We wanted the treatment that gave her the best chance at a normal life span. Even if the treatment had gotten her three years, would it have been worth it at the price of giving up the hope to lick it entirely? I don't know. But I do know I would love to hear your perspective on a range of issues. Thank you so much for coming in. Welcome Joe, If you spend some time on this board you surely will become a Top Doc in your field. The information and knowledge found here is amazing. The people are pretty amazing too. Welcome to our website. I wanted to thank you for firstly taking the time to read this message boards and find out even more about what your patients and their families go through during a cancer journey. And secondly thank you for being so considerate as to ask if you would be welcome. And of course, yes, you are very welcome. Not only are you welcome but I am sure everyone is glad that you are here. It takes a special DR. to care enough and take the time out of his busy day to be here to help all of us!!! Welcome, Welcome and Welcome again!!!! you are of course welcome to come aboard! i think that it is wonderful that as an oncologist, you find interest in these sites. please chime in whenever you have advice or questions. On behalf of your current patients, whereever they may be, thank you for continuing to try to educate yourself - both about what they are going through, and about how you may better help them. Like the others, I welcome you to this most valuable site. As I've told so many people, I simply don't know what I would've done without this group of people during these last few horrible months. But I'm warning you now - there are times when you might see some of your colleagues get a bit . . . well . . . let's just say "bashed"! Please don't take it personally. It's human nature for us to complain about the bad doctors more than to speak very well of the good ones. And those "bashing" posts might just be the ones you learn the most from! I look forward to getting to know you . . . I just wish my brother TBone were still alive so that he could've had the same privilege. I sometimes think of the oncology staff where we go - how hard they work, how consistantly courageous they are as they seek to help us any way they can ... THANK YOU. I think it must be a very special calling. How wonderful to have you here! I hope we will learn much from each other. Thank you for taking the time to seek us out. I absolutely agree with all the others and welcome you here with open arms. Not only for the perspective you will get from the people here but you will see how difficult the struggle is, both from a patient and a caregive respective. It is people like you and me that can carry this fight on and get the funding and advocacy for lc that is needed and warranted. Welcome! This group continually amazes me with the support and comfort that is given. Your perspective would be a wonderful addition. Ditto to everything that has already been said. You are most welcome here and your presence here certainly makes me feel better. Thank you so much for caring enough to stop by and wanting to continue stopping by. I agree with everyone else here-WELCOME!! You are so welcome here, we are a diverse group of people with the same goal, its sounds to me that you fit that bill perfectly..Thank you for caring enough about your patients to do this for them..
Oncodoc : To add my voice to the many already chiming in, don’t for one minute feel like you are invading as an "outsider", we all welcome you with open arms. Welcome Dr. Joe! Great to have you with us! Oncodoc, welcome. We had a big hole after loosing Dr Sam. We would love you to join us . As you will see we are young, old, American, English, Asian, Australian, we are parents, children, teacher, nurses, all trying to survive this frightening, vicious decease. We are sharing with each other our worries, our coping mechanisms, our hopes, our knowledge, our experiences. Many of us who are survivors or best friends with "NED" are trying to muster up public concern for support, finances for research, and early detection, and prevention. We all welcome your precious input, and care and concern for us. We offer a big cyber"""""""""HHHHHHHHHHHUUUUUUUUUUGGGGGGGGGG"""""""""""
Welcome to a family that I never dreamed existed until last Jan. and that I don't know how I lived without before then. This board is SO important to SO many people. Sure, you'll probably bombarded with questions, frustrations, etc. but I guarantee you that you'll also learn a lot - not only about cancer survivors, cancer victims, caregivers, doctors, etc. - but also about LIFE. One suggestion - don't reveal your location because with the attitude you seem to have with these first 2 posts, very soon your office waiting room might look like the Gulf of Mexico does this morning (overflowing, that is)!